Harry James Denton Goes Live On Eclipse Day! Today is August 21st, the day of the Great American Solar Eclipse. We watched it from the deck and it was amazing. Coincidentally (as if the eclipse excitement wasn’t enough), this is the day the Spearhead Press Ebook editions of the second three Harry James Denton novels went live for pre-order on all major outlets! Murder Manual has been republished under it’s original title Nobody’s Chain Lays Straight. 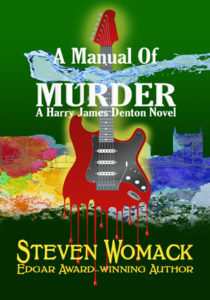 Murder Manual has also been retitled, now called A Manual Of Murder. 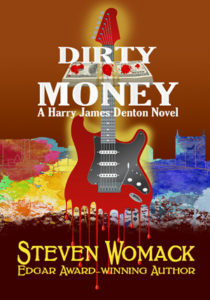 And the last installment in the series, Dirty Money, has retained it’s original title. While I don’t mean to favor one distributor over another, I will note that there’s a series page on Amazon.com, where all six books are on the same page. Nothing like making it easy! SEMWA Online Interview/Podcast Is Now Available! On Thursday, June 1st, I had a new adventure. I was the guest of a monthly gathering of the Southeast Chapter of the Mystery Writers of America. Only it wasn’t an in-person meeting. We all checked into a website and it was all done over that new-fangled Internet thingy. My thanks to the wonderful Beth Terrell for putting it together and my thanks to SEMWA for letting me put a link up so everyone can listen. It was a fun time and let’s all go support MWA! I’ve been very quiet on the blog and news front lately, but only because I’ve been so busy on other fronts. The fourth, fifth, and sixth Harry James Denton novels are in the publication pipeline. The fourth, Chain Of Fools, is ready to go. The fifth, Murder Manual, is with the copy editor, and I’m putting together the files for Dirty Money. My wonderful book cover designer, Dawn Charles at BookGraphics.net, is working on the covers as we speak. And here’s the beauty of the independent publishing movement–twenty years or so ago, when the Harry James Denton novels were originally published by Ballantine Books, I lost two different battles over titles. My editor didn’t like my original title for the fourth novel, so he vetoed it and called the book Chain Of Fools. 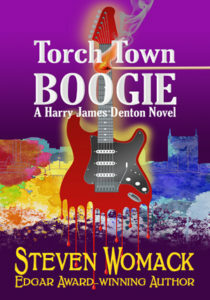 I think he was trying to maintain some kind of music riff after Dead Folks’ Blues and Torch Town Boogie. 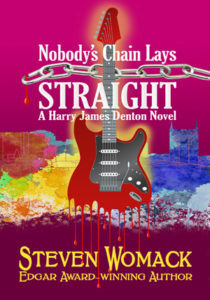 So since I’m now the publisher as well as the author, I’m reverting back to the original title for that novel, Nobody’s Chain Lays Straight. Hope everyone likes it. Same with the title to the fifth novel, Murder Manual. The original title for that one was Life’s Little Murder Manual. So that’s what it’s going back to. Are all back in print and available through all major EBook distribution outlets! Thanks to everyone for their support and kind words. We all appreciate it! So what is a shopping agreement? In an industry that is as complicated and as laden with legal minefields as film and publishing, a shopping agreement is an attempt to move a project forward without the time, expense and hassle of engaging a crew of lawyers. Harry James Denton Returns March 31st! Harry James Denton Returns March 31! The first three installments of the Edgar and Shamus-Award winning series featuring Nashville P.I. Harry James Denton will be reissued by Spearhead Press in digital editions on March 31, 2017. The books will be available from all major EBook distributors, including Amazon.com, BarnesandNoble.com and Apple.com/iBooks. The books will be available for pre-order approximately one week before pub date. The last three books in the series–Chain of Fools, Murder Manual, and Dirty Money–will be published in late May. Trade paperback editions will also be available at a date to be announced later. The Harry James Denton novels were published from 1993-2000. Each of the six installments in the series either won or was nominated for a major mystery award. 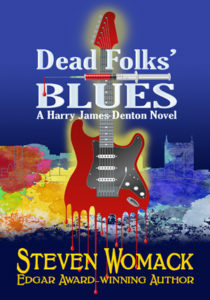 For the past several months, I’ve been very quiet on my blog, mainly because–in addition to teaching full-time and the rest of life–I’ve been working to republish the first three Harry James Denton novels under the Spearhead Press imprint. 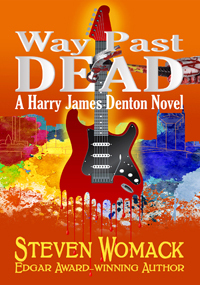 And the cover for Way Past Dead will be ready in January. I’d love to hear what you think. Shoot me a line. I’ve been totally overwhelmed by work and ramping up the new school year at Watkins. I’m teaching my first graduate class and have a whole list of new students, new projects, plus my own work. So things have been busy. Sign Up For My Newsletter! Interesting Stuff and No Spam!